OSWEGO – More than 250 people gathered recently to enjoy a weekend of history talks, demonstrations, art and literature at the third annual Oswego War of 1812 Symposium. Oswego Mayor Tom Gillen formally opened the symposium by unveiling a painting of the U.S. Brig Oneida by local artist Tim Ames. 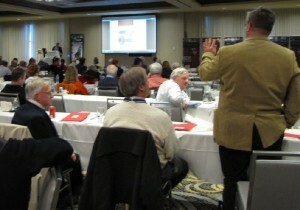 The audience is captivated as Major Sandy Antal (Canadian Forces, ret.) and Dr. John Grodzinski (Major, Canadian Forces), debate over the abilities and actions of British Governor George Prevost during the Oswego War of 1812 Symposium. Eleven speakers from across the U.S. and Canada explored a variety of War of 1812 topics, including military training and battle analysis, maritime and military archeology, naval history, wartime society and commerce, espionage, and the art of war. Participants also discovered engaging exhibits, living history demonstrators and historical authors who presented and signed their works. 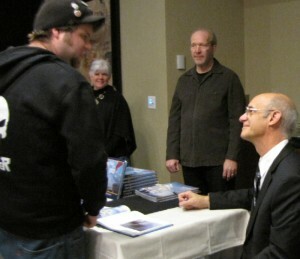 Dr. Peter Rindlisbacher of Katy, Texas, takes a moment to talk about the art of the War of 1812 in his new book, “War of 1812: Sea Battles on the Great Lakes.” After his presentation, Dr. Rindlisbacher unveiled his new book at the symposium and signed copies for the audience. Also at hand was a crew from WCNY-TV to interview participants and document the symposium for an upcoming program.